Do you love to eat out on weekends, but feel tired of choosing fish options on Fridays? Don’t forget about pizza! Henderson has many great meatless options that are equally as tasty. Take a look at these unique pizzas and side dishes that can accommodate your desire for a meatless Friday meal. You might be surprised at all the delicious things you will discover! Probably one of the lesser known pizza joints in Henderson, Mama’s pizza is known for serving up some good slices of pizza! What you need to try is Mama’s Double Decker Pizza Pie, loaded up with all the veggie options. Double the pizza and double the yum! Match it with some garlic bread and sweet tea, and it might remind you of your own mama’s home cookin’. There are plenty of veggie pizza combination options at Rockhouse! You might even be inclined to try their veggie stromboli or some of their meatless appetizer options too. Have you tried their jalapeño potato spuds, fried cauliflower, fried pickles or corn nuggets? We would recommend all of the above. Perfect options for a Friday meal with no meat! What do we love about Firedome Pizza? First of all, it’s the perfect time to check out their new location at 512 Barrett Blvd. Second, their pizzas are made in a wood fired oven, their crusts are baked warm to perfection, so even a simple cheese pizza will hit the spot. Their wings are really worth trying, but if you visit on a Friday during Lent, step outside the box and go for a Hawaiian pizza, just remember to ask your server to hold the ham! A town favorite (especially of UK basketball fans) with lots of options for a Friday veggie meal. Veggie Pizzas are available in a mini size and go up to extra large. Some yummy non-pizza dishes that you can enjoy guilt-free are the Mister B’s Signature Salad, loaded potato soup (with no bacon bits), the baked ziti or spaghetti parmesan if you like pasta. After dinner reward yourself with some fried oreos or twinkies, because going a whole day without meat is a victory! Prepare for a vibrant atmosphere full of fan spirit if you plan to go on a night when the Wildcats are playing. 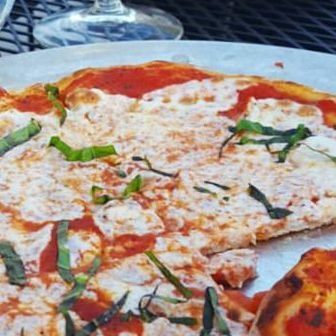 A winery that serves pizza? Yes please! 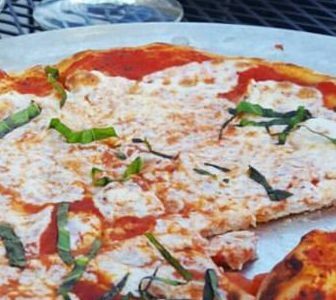 We can’t get enough of the fresh and authentic tastes of the pizzas at Farmer & Frenchman. For starters, the dough is made in house with a recipe passed through generations of the owner’s family. They offer plenty of pizza options without meat, and don’t get us started on the pasta! You don’t have to be Italian to taste the delicious-ness. Order the Quattro Formaggi pizza, Fresca pizza (one of our favorites), or if you are a fan of fish, get the Farmer Tommy’s Special pizza which comes with anchovies! Don’t knock it ’til you try it! One pizza is just enough for one person to eat (with maybe a little left over to take home). Be prepared to be tempted by amazing wines and sweets as well. It can get packed pretty quick on weekends, so call in advance for seating availability. Do you pass through downtown as you’re driving home from work? Grab your pizza to go on Fridays with no hassle from Pony Express. This is where the cheese lovers need to grab a cheese pizza, why you ask? Get ready for it… Mozzarella, provolone, cheddar, muenster, Monterey Jack, Swiss and Romano, all of which are toppings on the Pony Express Cheese Pizza. Need we say more? Oh, and breadsticks are only $2.99… what are you waiting for? A longstanding quaint, little carry-out pizza cottage nestled among bustling Green Street. If you’ve lived in Henderson, but never tried Rick’s Una Pizza, the pizza you need to try is the Chicago Style pizza. Okay so maybe this one is better with all the sausage and pepperoni, so maybe wait until Saturday to splurge on this one. This two layer pizza has massive flavor and a thick crust that measures one and a half inches thick! All topped in marinara sauce. Hours are limited, grab this pizza pie from Wednesday-Saturday from 4:30 p.m. to 8:30 p.m.
To see a complete list of local restaurants, including these pizza places, click to visit our Dining Page.